Mussels are not only inexpensive and tasty, they’re one of the most sustainable types of seafood—and can even help improve the environment. Here’s how to make mussels your go-to choice for sustainable seafood. Buying seafood responsibly is essential for protecting our environment, but choosing the right seafood can be complicated because of all the variables involved with the “sustainable seafood” label. At a restaurant or market, you might not know where a fish was caught or how it was caught, for example. 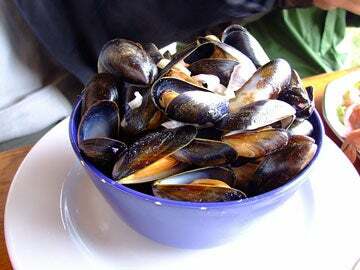 With mussels, though, “you’ll almost always get responsibly farmed shellfish that actually clean the water they’re grown in,” writes Francis Lam at Salon. If you’ve never made mussels, check out Salon’s primer, which includes instructions on how to clean, store, and cook mussels (pay particular heed to the warning about tossing shells that aren’t opening).